Sahil Dua, a developer at Booking.com, explained how they have been able to scale machine learning (ML) models for recommending destinations and accommodation to their customers using Kubernetes, at this year's QCon London conference (PDF of slides). In particular, he stressed how the properties of a Kubernetes cluster -- elasticity and resource starvation avoidance on containers -- helps them run computationally (and data) intensive, hard to parallelize, machine learning models. Each pre-trained ML model runs as a stateless app inside a container. The container image does not include the model itself, and instead this is retrieved at startup time from Hadoop. This keeps image sizes small and avoids having to create a new image every time there is a new model, thus speeding up deployments. Once deployed, the model will be exposed via a REST API, and Kubernetes will start probing the container for readiness to receive requests for predictions, until finally traffic will start to be directed to the new container. Besides Kubernetes' auto-scaling and load balancing, Dua revealed some other techniques used at Booking.com for optimizing latency of the models, namely keeping the model loaded in the container's memory, and warming it up after startup (by issuing an initial request to TensorFlow, Google's ML framework, where the first run is typically slower than the rest). Not all requests come from a live system; in some cases predictions can be precomputed and stored for later usage. Optimizing for throughput (amount of work done per unit of time) is more important for the latter. Batching requests and parallelizing those that are issued asynchronous helped reduce the networking overhead, and improve throughput, said Dua. 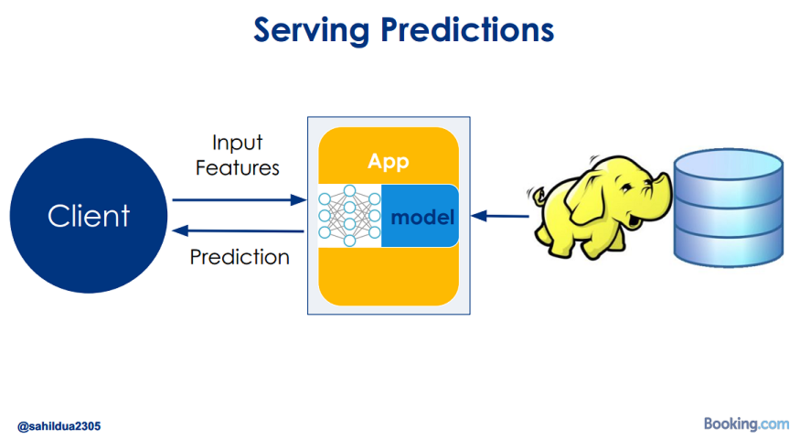 ML models need to be trained with pre-selected data sets before they are ready to provide the kind of predictions Booking.com needs. The training part of the process is also run on Kubernetes infrastructure. Base images for the containers where training takes place contain only the required frameworks (such as TensorFlow and Torch) and fetch the actual training code from a Git repository. Again this keeps container images small and avoids proliferation of new images for each new version of the code. Training data is fetched from Hadoop clusters. Once the model is ready (training workload finished), it gets exported back to Hadoop. Additional information on the talk can be found on the QCon London website, and the video of the talk will be made available on InfoQ over the coming months.